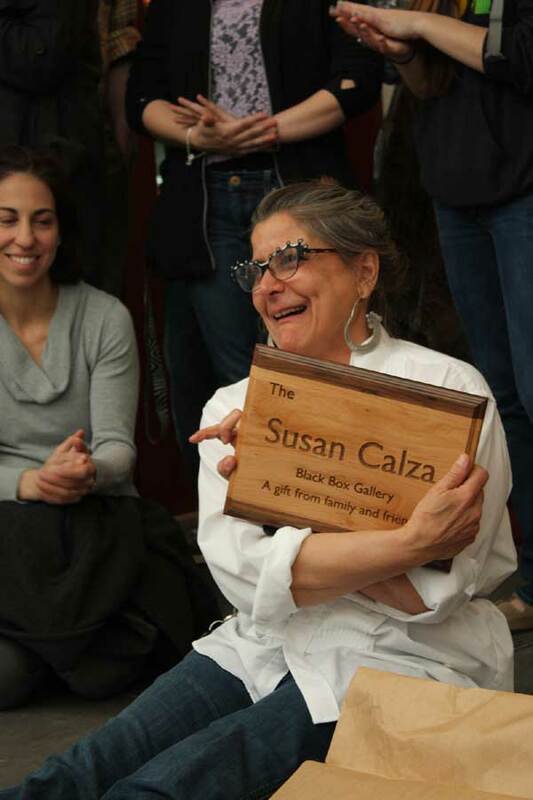 Although the JSC chapter of Professor Susan Calza’s life is ending, she will forever be remembered with the Black Box Gallery, which has been dedicated to her by students, staff and faculty. “Harlan Mack,” Johnson State College Professor of Fine & Performing Arts Susan Calza said. She stared at two paintings on the wall beside our table in the back of Wicked Wings in Johnson. Both paintings seemed to be of two colors, white and black, and where I struggled to see the theme of the painting, she saw a former student. 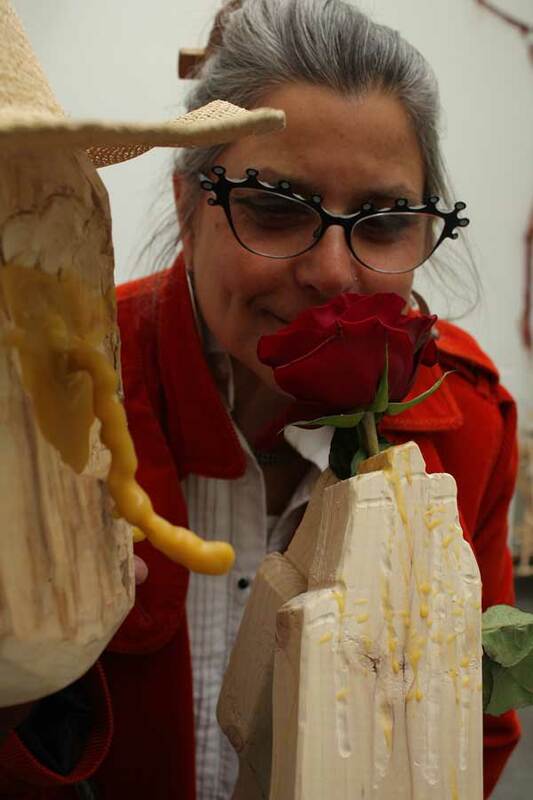 If every piece of work is a part of an autobiography, Calza has been piecing the story of much of her life together for the past 22 years at the Visual Arts Center. She’s described the experience as “full,” having raised a child, divorced, and remarried while teaching 3-D Art at JSC. Now she’s ready to retire and move on, comparing herself to the Tarot card “The Fool,” a person prepared for a journey, a pack in one hand and rose in the other as she steps off a cliff. In other words, she doesn’t know quite yet what she’s going to do and retirement is a big step. She does know it will involve traveling to exotic lands with her husband and working in her Barre studio. She said she feels that nurturing her introvert side will generate a creative force that will manifest in her art that has been inhibited while working at a college. This worry pushed her to an undergrad degree in art history years ago. Back then college art was formulaic, a set path to follow, and she said she found the idea of doing art assignments in college repugnant. But in the 70s she wound up teaching at a community college, moved on to be head of the sculpture program at the University of Indiana, and finally found her way to JSC, teaching 3-D Art. Like a famous Escher stairwell, life had led her to teaching the very thing she had tried to avoid. She decided she wasn’t going to be like the “other professors.” The only rule in her class is to be authentic and the foundation of her teaching style centered on her trust in chaos. She said she let the students sift through the grit so that polished pearl could surface. Projects had basic themes but the students expressed in their own terms. Susan Calza leans over a student’s sculpture at her last students’ exhibit. This doesn’t mean students could float through class. Sydney Arczynski, a fine arts junior who took sculpture class, said if a student didn’t put a lot of effort into a piece or held back on explaining a piece, the 3-D Art teacher knew and would call them out on their “bull crap.” But Calza’s skills went beyond helping students shape art and also helped shape lives. The same type of counsel has been instrumental for Erin Keyes, a junior pursuing a bachelor’s in studio arts. She said the sculpture teacher has helped her art path as well as her personal path, identifying areas of Keyes’ sculptures, and thereby her life, that may need more work. Two pieces stand out in Keyes’ mind. The first was a wooden box lined with cloth. The other was a plaster of a chest with a large gash in the center, which she covered with a feather. According to Calza, the deeper an artist goes into her work, the grittier it becomes and the more authentic it is. She said it’s like reading a poem, book, or meeting someone and knowing right off if the person is “bull shitting.” For her, true art intrinsically conveys a sense of a person’s essence; an autobiography. This chapter of her life is ending with farewells, hugs, and tears. Not only does she say good-bye to students, but also colleagues and friends she has worked with for up to two decades. Then there’s the art program, itself, a work in progress that has her fingerprints all over it. Professor of Fine & Performing Arts Ken Leslie said that the Visual Arts Program has gone through huge changes over the years, with Calza orchestrating a large part of it. According to a brief speech he made during Calza’s last student exhibit of sculpture and performance April 29 at the Visual Arts Center, she was the main reason there were two art galleries there; one with open light and windows and the smaller black room with controlled lighting. He then presented her with a plaque on which is written, “The Susan Calza Black Box Gallery a gift from family and friends.” Calza, nose pink and eyelashes batting rapidly, stared at the plaque for a few moments before cupping her hands together in prayer-like fashion and tipping her head in thanks. The retiring 3-D Art teacher is leaving her prints on the lives of the people she’s worked with, too.